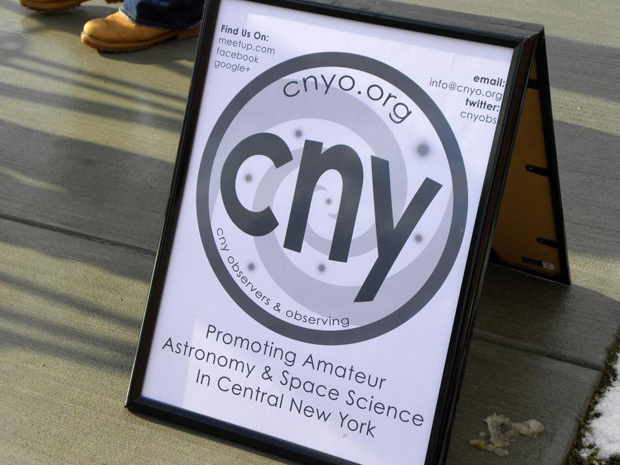 Tuesday April 2nd marked the Museum of Science and Technology‘s hosting of NASA Climate Day in Syracuse, NY. 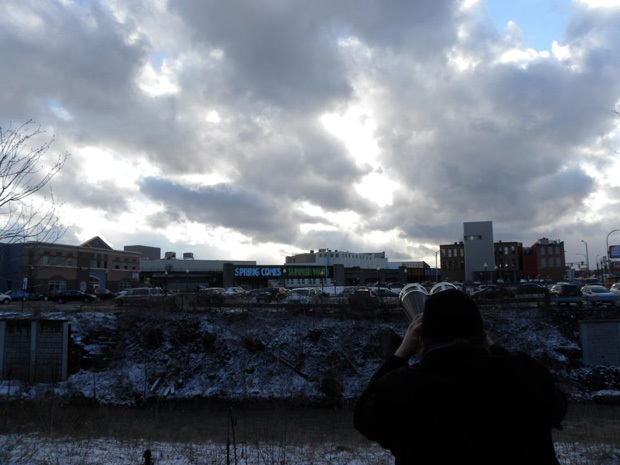 For CNYO members and attendees attempting to observe the Sun, April 2nd also marked one of the more remarkable mixtures of weather patterns to hit CNY. Patient attendees waiting for a clearing. Photo by Simon Asbury. 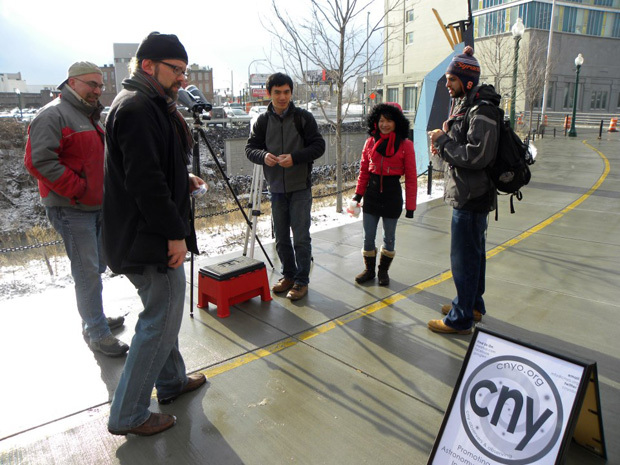 CNYO solar scope setup at Walt the Blue Dragon commenced promptly at 5:00 p.m. Given the expectation of snow and considerable cloud cover over the next few hours before the 7:31 E.D.T. p.m. sunset, I left my Dobsonian at home and Larry Slosberg opted to keep his Meade SCT in the car. Our equipment for the event consisted of a pair of 25×100 and 10×30 binoculars (both with homemade Baader filters) and one Coronado PST. Also in tow were several garbage bags for rapid covering of all the equipment. The author looking for a clearing through Baader’d Zhumell 25×100’s. Photo by Simon Asbury. The sky was windy, cloudy, patchy, and fast-moving, intermixing light snow with perfect blue patches near (but not always overlapping) the Sun. Over the course of about 80 minutes, only 10 good minutes of solar observing were had, and most of these involved some amount of cloud cover obscuring prominent Sunspot 1711 and several smaller Sunspots. The Coronado revealed a large triangular prominence and plenty of surface detail with a 20 mm Plossl and a TeleVue 3mm-6mm Nagler Zoom. It was during the Coronado observing that Bob Piekiel mentioned a certain tweak that can be performed to the PST (and other models) to improve the view (a forthcoming article documenting the procedure is in the works!). 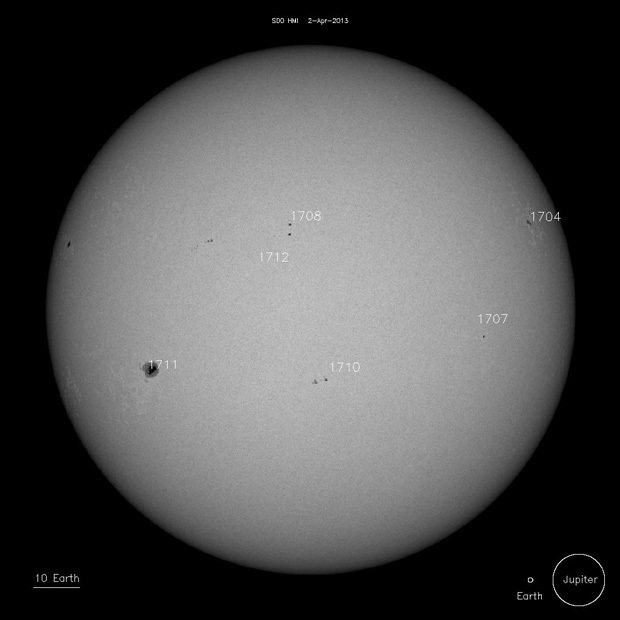 View of the Sun on April 2nd, 2013. From sohowww.nascom.nasa.gov. The outside part of the NASA Climate Day festivities ended as a massive grey cloud approached from the distant East (that proved to drop the largest amount of snow on Syracuse not 30 minutes later), instigating the packing up of equipment and migration into the MOST itself to see the rest of the event. In all, only a few left the climate-controlled confines of the MOST to see the filtered Sun, but we did get a few passers by to look, at least one of whom made it onto our facebook page recently. LESSON FOR THE SESSION: When it’s freezing cold, blustering-ly windy, dark-grey overcast, and only a slight hope for long patches of clear skies exists, keep the solar scopes close to the exterior doors of the building where the main event is going on. The indoor part of the CNYO session consisted of a small presentation area for showing a few videos of solar events, how the Baader and Hydrogen-alpha filters (in the Coronado) work (having stolen an incandescent light bulb from a bicycle-powered demonstration for the Baader demo), and the relative sizes of the Sun and planets in our Solar System. 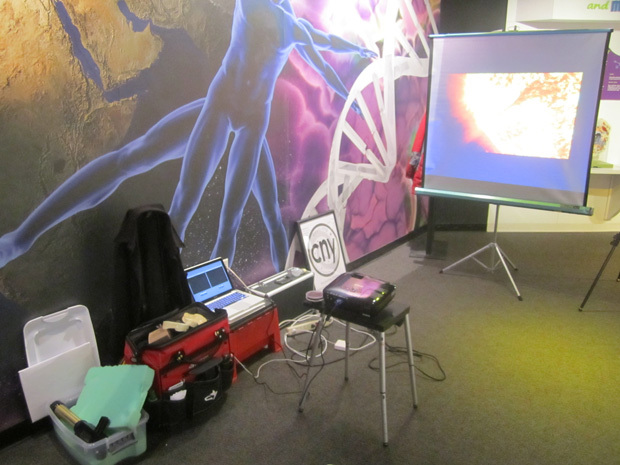 We moved inside just as Dave Eichorn began his keynote lecture and unfortunately missed his presentation, but that did give us time to walk around the displays near our little setup (appropriate placed next to the vision display). The demo of the Baader film with the incandescent bulb (to easily see the spring inside) was one of the indoor highlights (well, I thought is was interesting), then we finished the evening with a few students asking some very good questions about solar activity, the dangers of space flight, and potential plans for Moon and Mars Missions (which is always the real highlight of any CNYO session for me).